Andy Petranek checks in from his event. The SoCal Sectional went down in Drake Stadium at UCLA this last weekend. 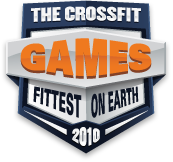 Event organizer and CrossFit Games competitor Andy Petranek sent in his wrap-up. Representing all those closet geeks out there. Representing the 30-plus sect from SoCal. A first look at SoCals upcoming sectional schedule. Affiliate teams in SoCal will be crossing their fingers that the coaches of CrossFit South County qualify for individual competition or they might form a potentially deadly Affiliate team! Janee Meadows and James Grundler are the team behind the poster designs for the 2010 SoCal Sectionals. James writes for television, radio, and major motion pictures. Recently James and his band Golden State, were featured on the new Apple iPad commercial. This years SoCal Sectional is going to be an amazing event. Over 200 athletes have already signed up to compete for the 40 Regional spots (20 men and 20 women). The Competition in SoCal is expected to be one of our biggest so far.